My CONAN The BARBARIAN Omnibus volume arrived from America yesterday and I just love poring over it, drinking in the vibrant colours and ornate BARRY SMITH artwork. If you're going to buy this book, get the one with the variant Smith cover, as the other one by JOHN CASSADAY and LAURA MARTIN is truly awful - sorry, but it is! Really, it has to be the worst cover I've ever seen on an Omnibus edition. Conan has no neck, looks as if he has no hair on one side of his head, his arms are stiff, and his legs are twisted in unnatural positions. The colours are nice but can't save the drawing, and I'm surprised that it was ever chosen as the main cover of the book. Another thing that irks me is that issue #9's story has no corner page numbers, being seemingly sourced from a later reprint in which they were removed, and #12 has no corner page numbers on the last two pages, though the second-last one shows faint traces of where it had been. (Perhaps someone with the original issues can check just to make sure I'm right in what I say. It's always possible that the last page never had one.) A book this expensive really should be the definitive version, but sadly isn't quite that. However, it's a very handsome volume, and even though I've got all of the tales in the softcover DARK HORSE reprint series from a few years back, it's nice to have them in (mostly) their original shape and form. Once MARVEL has sorted out the typos, I may buy a new printing in the future, but in the meantime this one will do for now. 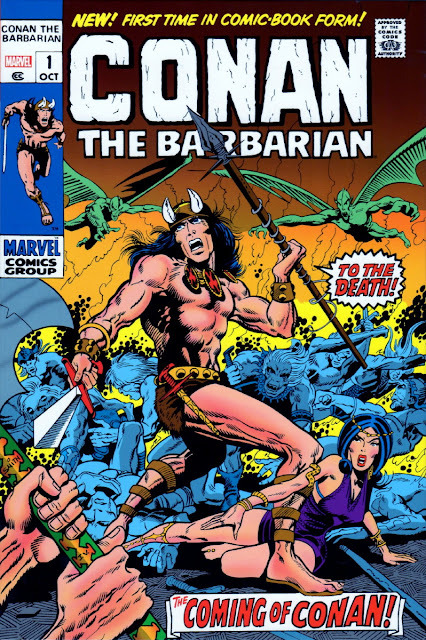 It's just great to see Smith's cover on the front of a book of this size -and if you're a Conan fan, you'll be able to overlook its few imperfections and gladly add it to your library of Marvel Omnibuses. Speaking of which, far too many of them have faults like the ones detailed above, and it's time that Marvel fired their proofreaders and got folk that can do the job properly. You know the old saying - "If it's worth doing, it's worth doing well!" That really is a godawful cover. It's like they've traced a poor Conan rendering over Dr Doom's 'dramatic' angry villain posture from How to Draw Comics the Marvel Way. Bad. Yeah, I just don't know what they were thinking with that one, OD. 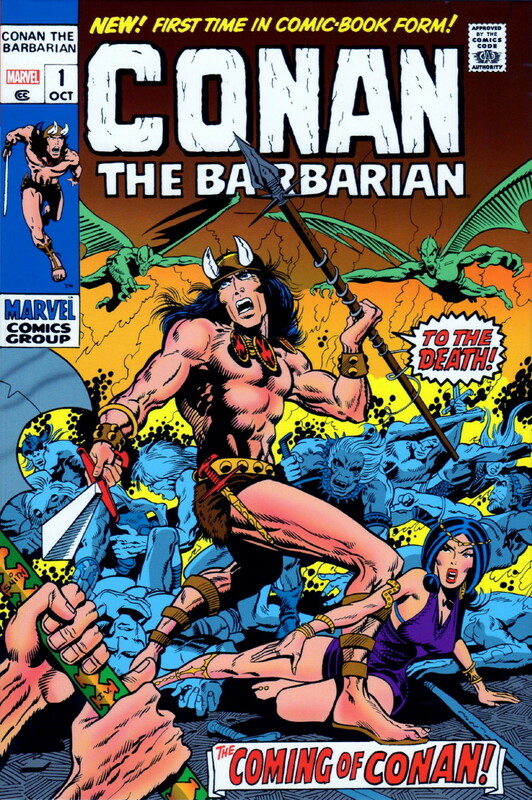 Why is the Silver Surfer mentioned in a Conan volume? You mean you missed the 1983 team-up between Conan and the Surfer, CJ? Call yourself a Marvel fan? Relax, only joshing. He's mentioned as part of a list of characters that John Buscema drew. It's in an intro to Dark Horse's Chronicles of Conan Vol. 4, which the Omnibus reprints in the back of the book. 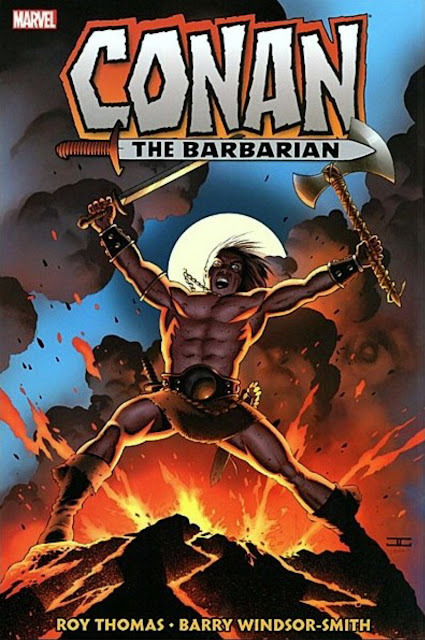 I had some of those Dark Horse volumes reprinting Marvel's Conan stories and now Marvel are starting to reprint Dark Horse's Conan in return. I've got the first four softcover editions, CJ. I gave up on them when they regularly started replacing the original lettering with computer fonts, and making all sorts of mistakes in the process. 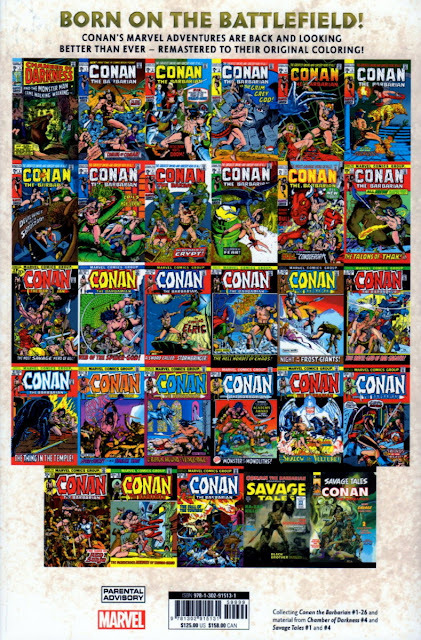 I also didn't like the fact that they missed out the 'Conan The Barbarian' heading on some of the splash pages, though I thought some of the computer colouring (if such it was) was quite nice. The later hardback editions included the covers, but 'Marvel Comics Group' was edited out. I have the first two dark horse hardcovers. I like this one. So do I - I just wish there weren't so many typos.